MEMBERS OF THE SENATE VOTE on a motion to approve the Union Annual Report. The Senate approved the Union Annual Report Committee’s recommendation for the Fiscal Year 2020 activity fee and the Union Annual Report Fiscal Year 2020 on January 28. The activity fee is charged to all Rensselaer students alongside their tuition, and currently serves as the primary source of income for the Union. This money—in addition to income from the Collegiate Store and other businesses within the Union—is what the Executive Board budgets and spends each year. It pays for clubs and their programming; operating the Union, Mueller Center, and RPI Playhouse; the employment of staff; and other student services. The specifics of how this money is allocated and spent is detailed in the Union Annual Report for that specific fiscal year, and is made available to the public. In 1985, the activity fee for undergraduate and graduate students were separated, so that they could more fairly charge students based on what they use. The activity fee and reasoning behind its value was explained by Union Annual Report Committee Chairperson Mary Clare Crochiere ’19 and President of the Union Justin Etzine ’18 G ’19 in a presentation. For the first time—according to the memories of Crochiere, Etzine, and the Union staff—the UAR Committee proposed a decrease in the graduate student activity fee from $342 to $338. Crochiere and Etzine explained that this decision was based on “attendance analytics” and the desire to charge graduate students more accurately based on their use of the Union and its activities. When asked about the specifics of these analytics, Etzine explained that they used the Institute’s swipe attendance system at events and the Mueller center, along with memberships and attendances listed by clubs. Last year, the Graduate Council gave a presentation on why the activity fee should be lowered for graduate students; it cited lower-than-assumed participation rates and a difference in culture that prevented as much involvement in Union activities. However, most of the Senate agreed that these issues were brought up too late and should instead be discussed for the 2020 fiscal year. The motion to approve the recommendations for the Union activity fees passed unanimously. The Senate then moved on to the actual Union Annual Report Fiscal Year 2020; there was no presentation on the report, but it was emailed out to the Senate on the day of the meeting at 11:15 am. 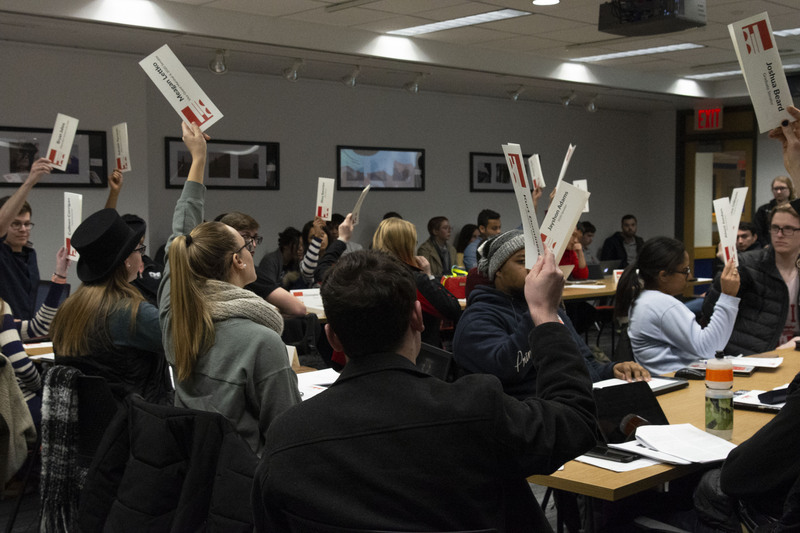 There were no questions, and the motion to approve the Union Annual Report Fiscal Year 2020, “pending the Board of Trustees’ approval of the Activity Fee Recommendation and overall budget in March 2019” passed unanimously. The language of these motions has changed from last year’s approval of the activity fee and the UAR, to specify that these amounts are “recommendations” that are pending approval. “Accordingly, no announcement of or statement about activity fees or the Union budget should be made until after approval of the institutional budget,” wrote Gregg.